Resident Mirian Medina stands on her property about two weeks after Hurricane Maria swept through the island on October 5, 2017 in San Isidro, Puerto Rico. Hundreds of Puerto Ricans who have been living in motels and hotels on the mainland as part of FEMA’s temporary housing aid after Hurricane Maria have to check out on Sept. 14, a federal judge ruled on Thursday. Although the judge, Timothy Hillman of U.S. District Court in Massachusetts, decided to end FEMA’s Transitional Sheltering Assistance (TSA) program in two weeks, he strongly urged the parties to work together to find temporary housing for the families before then. 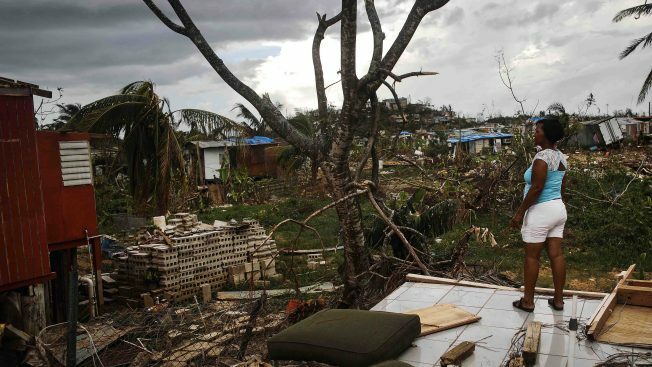 NBC News reports the decision came down after LatinoJustice PRLDEF, a national civil rights group, filed a lawsuit on June 30 seeking a restraining order to stop FEMA from ending the program, which the group said would lead to the families' evictions. When the lawsuit was initially filed, 1,744 Puerto Rican adults and children were in the program, an attorney involved in the suit said.